At Whitcomb Brothers Grain Systems, Inc we pride ourselves on being #1 in service. From storm damage to replacing bearing and everything in between we will be there to get you back up and running. Check out our preventative maintenance programs to make your harvest season go smoothly! 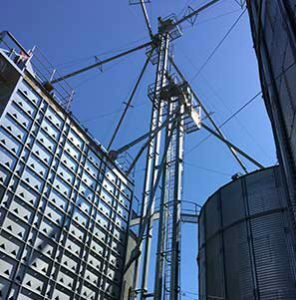 Call us early summer to schedule your pre-season service on all your grain handling equipment. Whitcomb Brothers also offers a scheduled monthly, quarterly or yearly site service. If your site gets damaged from a storm, give Whitcomb Brothers a call! We will get your site cleaned up, rebuilt and ready for harvest. Our crews can repair all types and sizes of sites. From collapsed roofs & dented bin sheets to bearings, pulleys and unplugging spouts and vents. We will do whatever it takes to keep our customers running.